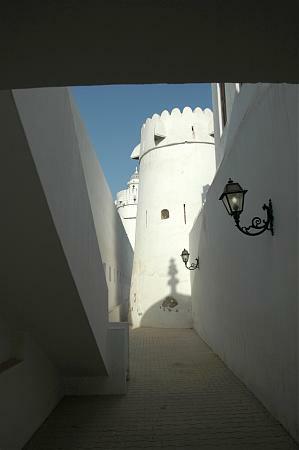 As we stand in the narrow gap between the Qasr’s inner and outer walls, it’s easy to see what Mr Kyffin means. Under his expert guidance, layers of history reveal themselves as material memories, and the convoluted narrative of Qasr Al Hosn and its relationship with both the city and the nation unfolds. 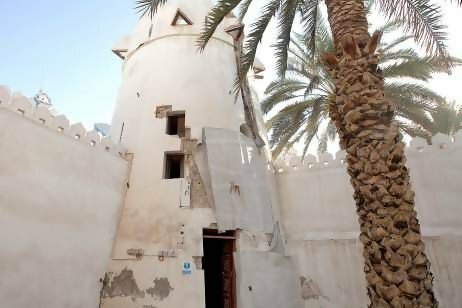 It is the story of how the seeds of the Abu Dhabi we know today were sown in around 1760 with the construction of a small round watchtower, or burj, built at the order of Sheikh Dhiyab Bin Isa, then leader of the Bani Yas. 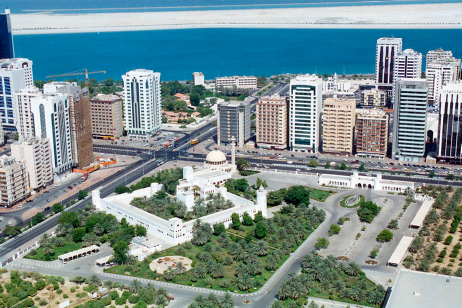 After his successor Sheikh Shakbut bin Diyab Al Nahyan moved the Bani Yas from the Liwa to Abu Dhabi, the original burj became the northeast tower of a compound that developed, during the nineteenth century, into Qasr Al Hosn, a dynastic seat, a symbol of power, and a refuge in times of strife. In the early 1940s, Sheikh Shakhbut Bin Sultan used funds raised from the signing of the first oil concessions to transform a pragmatic defensive structure into a palatial royal residence, and the crumbling walls of the old fort, now obsolete, were enveloped within the eight-metre high perimeter that stands today. 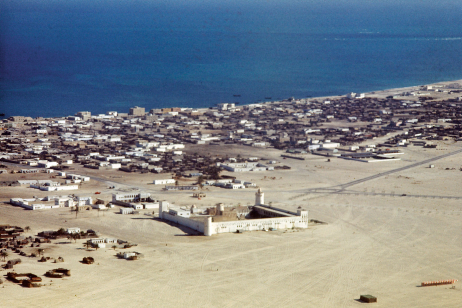 Finally, in the 1980s, Qasr Al Hosn underwent extensive rebuilding, renovation, and reuse and the building became home to the offices and archive of the organisation now known as the National Centre for Documentation and Research. By this time, petrodollars had begun to make their mark beyond Qasr Al Hosn’s walls, and the whole compound became enveloped by the modern city we know today. The role of the very first burj was to protect that most vital resource, drinkable water, from external raiders and while it has always been understood that the relationship between the source of that water and Qasr Al Hosn was straightforward, Mr Kyffin’s experience suggests that the reality may be more complex. While Mr Kyffin’s hypothesis about the bedrock may be just that, modern technology does afford him a degree of certainty in other areas. Thanks to a network of sensors across the compound and a laser, he receives an SMS whenever there is any vertical or horizontal movement in the building. There is surprisingly little, which is a very good thing considering the purported age of Qasr Al Hosn’s oldest structure. Beak-shaped projections that extend out from the top of the burj, the kasm would have allowed defenders inside the tower to fire bullets or other projectiles down onto any attackers below. Crucially for Mr Kyffin, are their size – later towers also have them but they are purely decorative, being too small to have ever been useful – and their location. 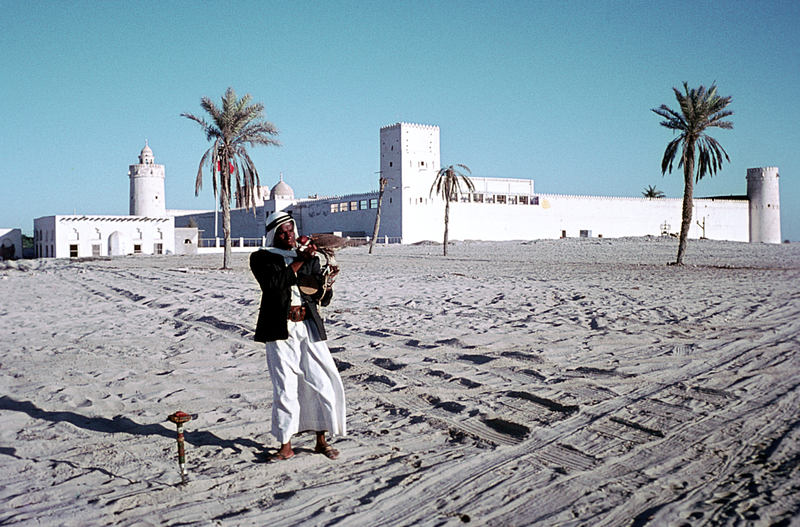 This 1965 photograph shows a falconer in front of Qasr Al-Hosn. The photograph is from the Colonel Edward “Tug” Bearby Wilson Collection in the National Library, Abu Dhabi. Some of the earliest depictions of Qasr Al Hosn appear on maritime charts and date from a time when the fort was one of the most recognisable landmarks on what was then known as the Trucial Coast. In part this was due to the fort’s size – it dominated the modest arish huts and compounds built near it – but also to its startling colour. 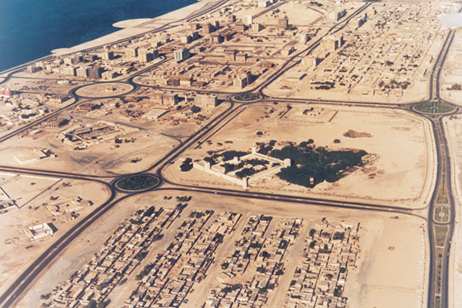 According to Reem Tariq el Muttiwalli who wrote a detailed architectural history of the fort in the late 1990s, Qasr Al Hosn was known as the ‘white fort’ because of its cladding in a locally made material called juss. Made from a mixture of ground coral, seashells, and sand, the juss, was then burnt, crushed, and mixed into a paste before being used as both mortar and render. It is this intimate knowledge of locally available materials and their properties that marks the oldest parts of Qasr Al Hosn as such an important example of the vernacular architecture of the region. Roof beams were made from local trees such as mangrove and their size, rarely larger than 3.6 metres in length, dictated the size of the original rooms throughout Qasr Al Hosn. According to Mr Kyffin, oral histories also relate how coral stones were cut from the seabed before being cured on the beach so that they became hard enough to build with. Not only was this an intelligent use of local materials, but the porous nature of the coral stone also meant that it was ideally suited as a building material in Abu Dhabi’s harsh climate. During the day, the coral stone absorbed the sun’s heat, stored it in the wall, and effectively insulated the interiors of the fort while the juss mortar, made of the same materials, allowed the walls to expand, contract and to breathe. At night, when the temperature dropped, the coral stone released its stored heat back in the building, acting almost as an early form of central heating. Remarkably, contemporary architects use similar principles in sustainable building practices today. The overall effect of Qasr Al Hosn’s many historical changes, adaptations, and modifications is a bewildering palimpsest, but nowhere is this layering of materials, construction, and history more evident than at the northeast corner of the palace’s curtain wall. Here, a vertical strip of the modern white concrete render that replaced the original juss, as part of the renovations of the 1980s, has been removed in what Kyffin describes as a ‘biopsy’. Not only has this exposed the original masonry underneath, it has also revealed a series of later repairs and modifications that provide important insights into how the changes witnessed by the city in the 20th century have expressed themselves in its urban fabric. For Mr Kyffin, it’s that coming together of architecture, history, and society that makes the forthcoming Qasr Al Hosn festival so exciting. Not only will it allow Abu Dhabi to become reacquainted with the heritage of its past, it should also allow the public past to play an active role in the conservation of its future. Colonel ‘Tug’ Wilson (1921–2009) was a British army officer who, in the 1960s, was seconded to the government of Abu Dhabi to help build the national defence force. He was a personal friend of the ruler of Abu Dhabi, Sheikh Zayed bin Sultan Al Nahyan (1918–2004), with whom he shared interests in falconry and horseback riding.